The Maricopa Chamber of Commerce will not renew its lease for office space on Honeycutt Road this September. 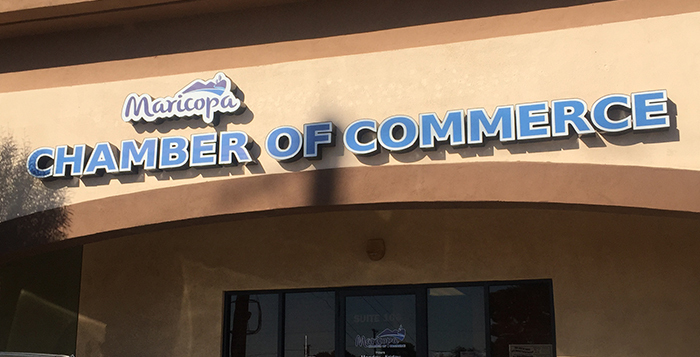 In a news release published Friday, Chamber Board President Chris Cahall said the organization that promotes small and medium-sized businesses in Maricopa will operate “virtually” after its lease expires Aug. 31. Meetings are proposed to take place at member businesses and, possibly, the Central Arizona College campus in Maricopa. “We’ve got to evolve in order to keep up with how the world is changing, and I think this is going to be an awesome change for the Chamber and the membership,” Cahall told InMaricopa. Cahall would not confirm if the Board’s vote was unanimous, instead saying the decision was approved. The chamber’s evolution outside the budget-binding confines of its $2,300 monthly rent payment will allow it to focus those funds on member services, Cahall added. Currently, three-quarters of members’ dues are allocated to rent and the executive director’s salary. A minority of in-office visits involve visitors inquiring about member business information. Cahall said 90 percent of Chamber foot traffic is to the visitors’ center – a local tourism effort defunded by the City of Maricopa. “How are we able to provide optimal benefits if most of our membership monies are going to a facility and only 10 percent of the people walking through the door on an annual basis are looking for membership information?” Cahall asked. The Board’s answer is to wave good bye to its brick-and-mortar, an idea first proposed in a meeting with members two weeks ago. “We think (having meetings at members’ businesses) will allow our networking events to be more member-centric on their turf,” Cahall said. In addition to its member services like the networking and ribbon-cutting events, Cahall said the Board has proposed implementing an annual business speaker, as well as educational opportunities for members. The Chamber’s monthly breakfast will still be held at Elements Event Center. Cahall said the Board has also discussed using a portion of member dues to revamp the Chamber’s website, and is open to hearing ideas from members. While it prepares to spend its last few months in its office space, the Chamber is also hunting for its new leader. The Board is accepting applications for the new executive director until June 1 at 5 p.m., according to the news release. The person who fills that role will eventually work from a home office after the Chamber moves out. Cahall said a candidate living in Maricopa is preferred. The board president said he’d like to see the new director establish a visible presence in the community. “I really want that executive director to be out with the members and be out finding members, and spreading the message of our small and medium-sized business community through Ahwatukee, Casa Grande, Chandler and attending networking events to assist and to continue to layer on member benefits showcasing the Maricopa chamber,” Cahall said.